Four-poster bed and designs by interior designer Julian Maurice add a touch of class. The Ripon Spa Hotel enjoys a central location close to Ripon College, Mallorie Park, Westgate and Ripon Cathedral. Sitting alongside the citys ancient Market Square and enjoying several acres of its own mature parklands, this handsome three-star hotel offers a shockingly good selection of areas to relax. 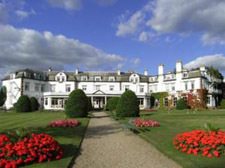 Guests at the hotel can choose to spent a day tupping a hoop or two on the croquet lawn, a round of crazy golf in the Spa Gardens next door or simply soak up a few rays in the leafy, award-winning hotel grounds. Breakfasts at the Ripon Spa Hotel are a treat with fruits, freshly-baked breads, dry-cured bacon and prize-winning sausages to look forward to. The Turf Restaurant offers a relaxed and informal bar bistro and there are a good selection of hand-pulled ales and beers.